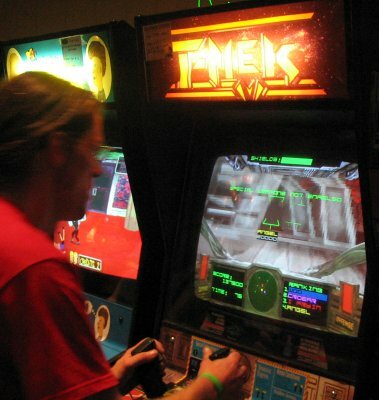 On Saturday, August 6th, 2005, I went to my first California Extreme classic arcade game show. 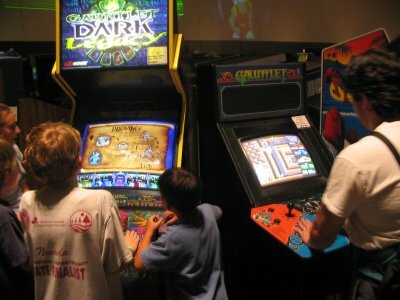 Pay to get in, and all of the arcade games and pinball machines are set on "free play" for your enjoyment. It's quite a gathering of people and games. 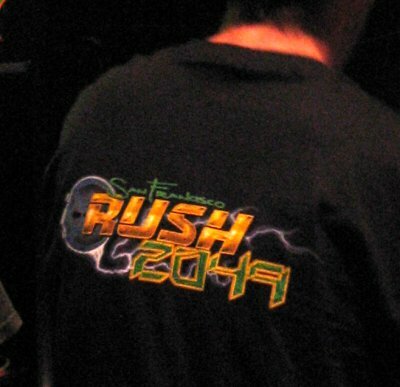 Here's a bunch of semi-random photos I took while at the event, organized by video game title, for the most part. Enjoy! Uhh-huhuhuh! Woah! Why had I never heard of this? 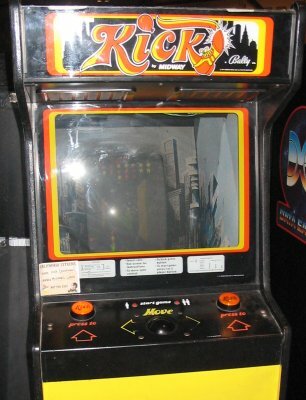 An Atari game, too!? Oh... it's a prototype. 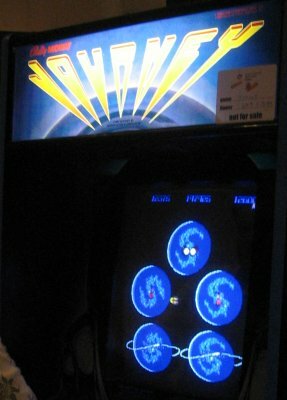 An interesting vector game from Atari that I had never played until I got one of my many classic game discs for the PlayStation. This reminds me of Outlaw on the Atari 2600 (and, no doubt, in the arcade), except the characters get smaller when they walk off into the distance. And they turn into gravestones when you shoot them. I had never seen this game before. 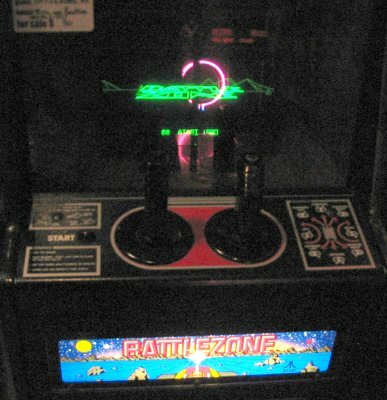 It's color vector-based and uses a rotary (paddle) controller. 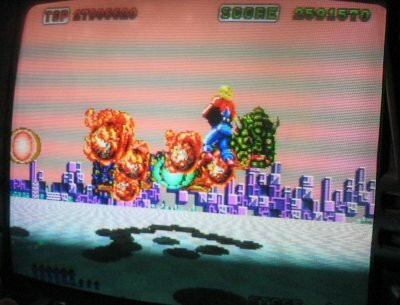 The game looks kind of like Star Castle, except you control the combination boxing glove / gun in the center. 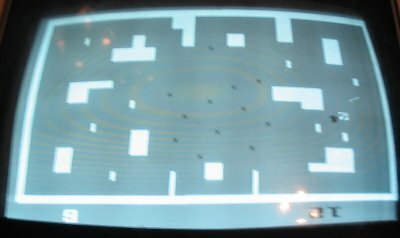 Bugs wander around pushing bombs up against the walls to blow them up. You can punch the bugs, but need to swing around 180 degrees to shoot the bombs. Intermission. You're apparently a kid with a baseball cap and a boxing glove-loaded jack-in-the-box. Spoiler: it backfires. I now know two people working on this game. 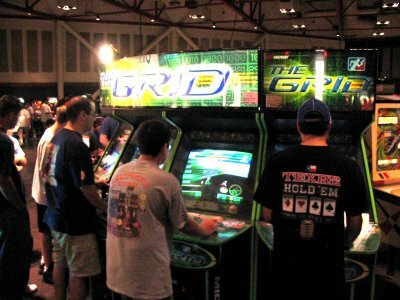 Lx Rudis, who I met at Classic Gaming Expo last year (he did sound on lots of Atari Lynx games), and Aaron Hightower (who I saw today for the first time since I was being interviewed at Atari Games, back in 1998). Small world! You might not be able to tell from looking, but this thing's apparently running Linux underneath. 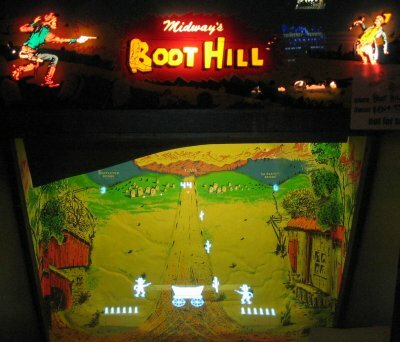 One of my favorite games of all times. A race where you can blow your opponents up by either smacking them into walls or jumping on them. You also need to jump over water. Control panel, with more cute artwork. The attract screen shows how many points each of the bizarre-looking vehicles are worth if you smash them. 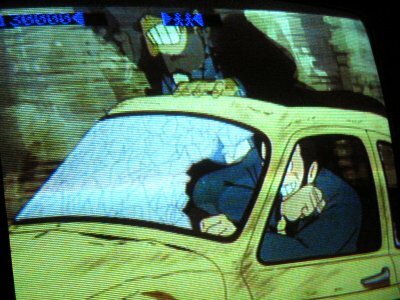 This is a laserdisc game which seems to be based on the 1970s Japanese cartoon "Lupin the Third," though it doesn't say it. This game is very pretty, despite the fact that the video is black-and-white. Ya gotta love overlays, mirrors and such! 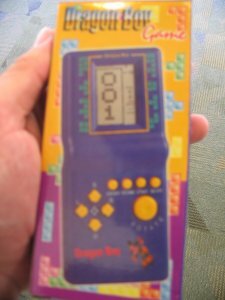 This cheap-looking little electronic LCD game was given away to all of the California Extreme attendees, it seems. 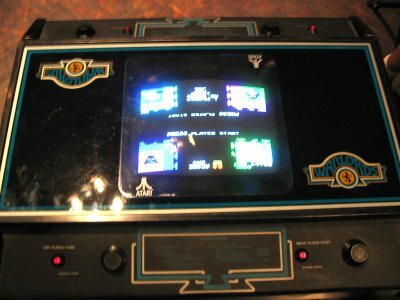 It has a screen made for Tetris, but in the 5 minutes I spent looking at it, I only found a couple of racing game, a Frogger-like game and some Space Invaders style games. One side of the box it came in. What the heck's with the Mickey Mouse image!? Really all I can say about this is: I need to cut my finger nails. 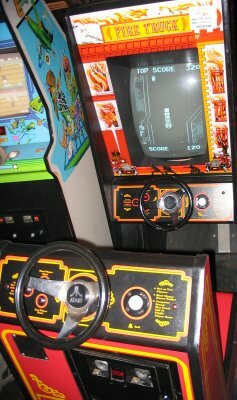 This old Atari game had two steering wheel controls, one in front, and one in back. Just like older fire trucks! 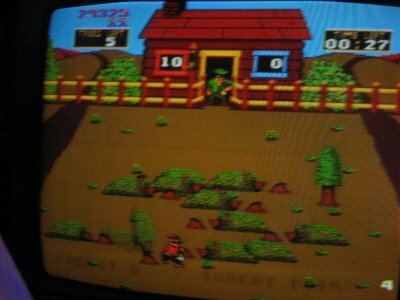 Another one of those games I remember really enjoying as a kid. 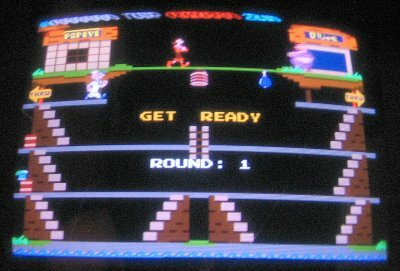 My brother and I played it at "Clown Alley" restaurant in San Francisco when my family stopped there on the way home from... whatever we did in SF when I was a kid. Exploratorium, usually, I guess. 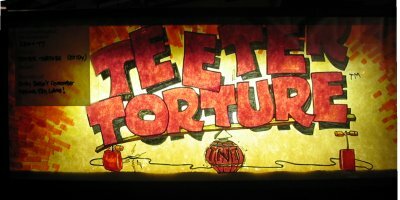 Food Fight, including its marquee. 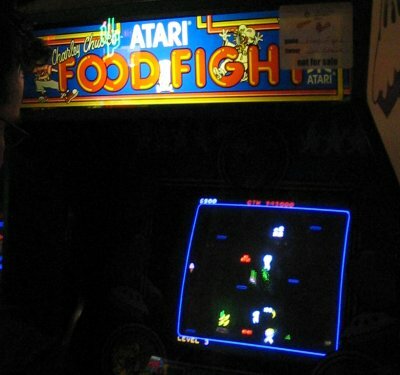 A blurry closeup of Food Fight. It's insanely cute for having such a plain black background. 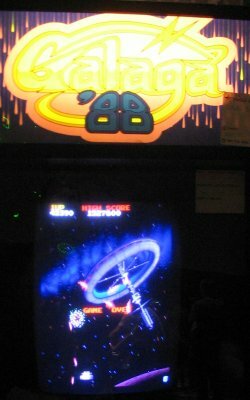 Galaga '88 marquee and game screen, with gorgeous space station background. Gauntlet was originally DANDY (get it? "D&D"? 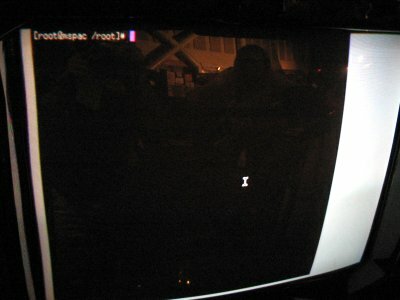 ), an old Atari Program Exchange (APX) game for the Atari 8-bit computer. 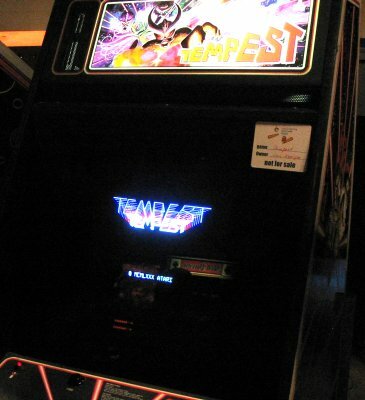 Atari apparently liked the idea enough to write their own arcade game. 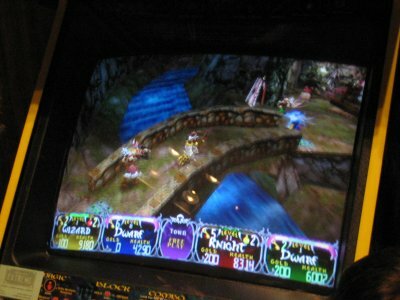 Left: Gauntlet Dark Legacy, one of the more recent 3D remakes of Gauntlet. Right: the original. Pretty 3D graphics in Dark Legacy. Pretty 2D graphics in Gauntlet. 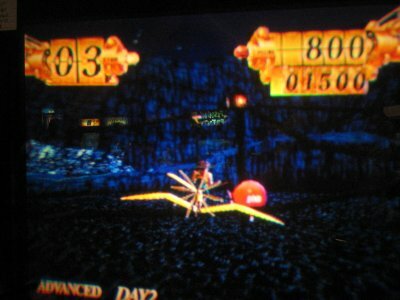 This is a 3D 3d-person shooter from Midway in 2000 (maybe one of the last coin-op games they did?). They had 6 or so of these units stuck together, and it was always busy. 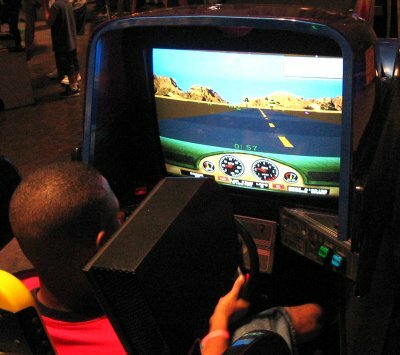 Okay, this is Hard Drivin', the 3D driving game... except you have a big red "Wings" button which turns your car into a flying car. You can pull the steering wheel straight out towards you to climb, and push it back in to dive. Bizarre. Someone trying to figure out the game. Fly through the red boxes on the screen for some good, old fashioned Red Box Bonuses. 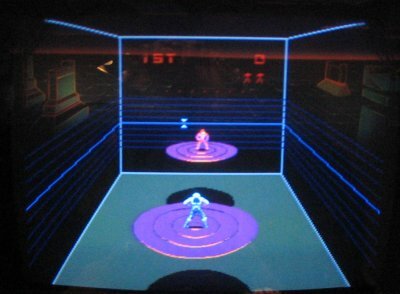 This is an incomplete prototype game that lived in a San Francisco Rush: 2049 cabinet. 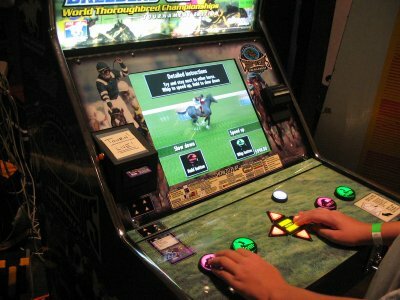 It had a big warning label on it that said you shouldn't try to load a certain track or it'd crash. Well, it seemed someone didn't read that sign. 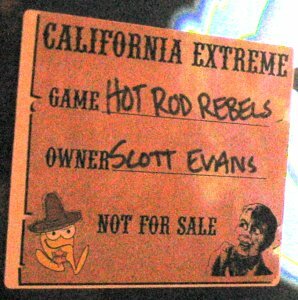 The info sticker for Hot Rod Rebels. That looks familiar! This puppy's running Linux with X-Window. Notice the "root#" prompt at the top left. 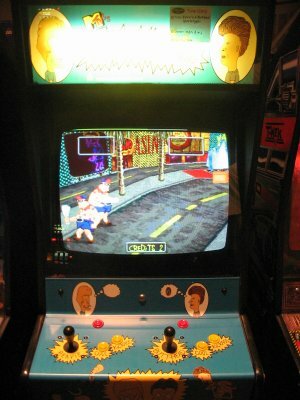 This was the game I went to California Extreme to see. 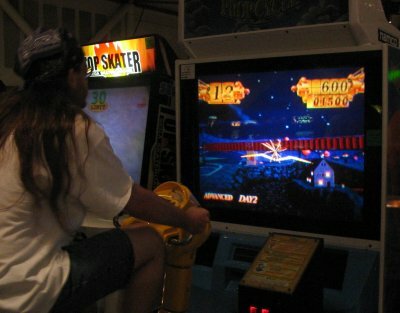 I played it once, probably 20 years ago, at some water park (probably Windsor Water Works up in Sonoma County). 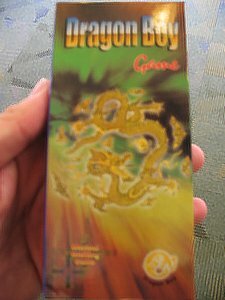 It was probably the first 3D polygon game I had ever seen, and I never saw the game in real life again until today. It's an interesting game, and actually still quite fun! The attract screen has lots of rotation and light-source movement. 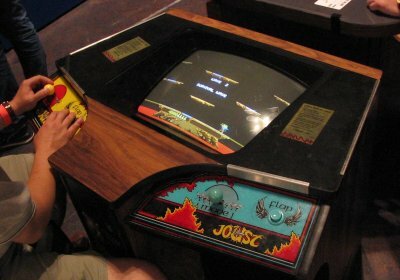 Table-top Joust, where players sit side-by-side (rather than facing each other). 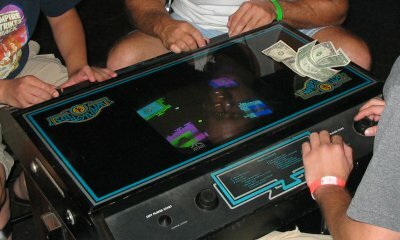 One of a row of various table-top games on display. 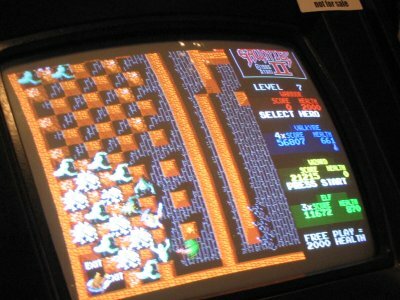 I'm pretty sure I played this as a kid, and I'm pretty sure I really liked it. 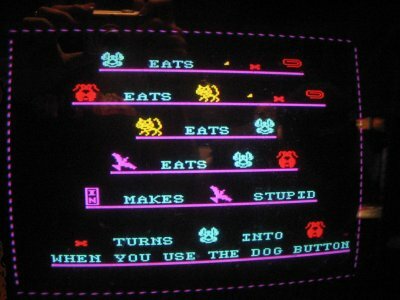 It's got neat controls: a 4-way joystick, three big, backlit, colored square buttons that control doors/traps on the screen, and a big "dog" button. Collect bones so that you can transform your mouse into a dog and give the cats a taste of what they've been giving the mice. The Mouse Trap attract screen explains some important rules. For example, "(In) makes (hawk) stupid." 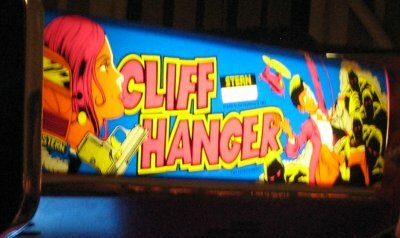 A couple people were mentioning how weird this pinball game is. 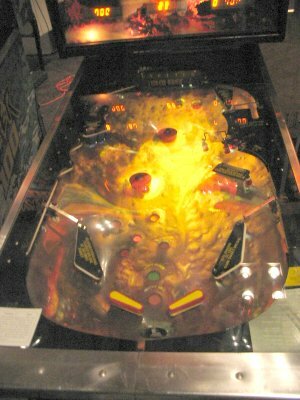 The playfield is not flat, but has trenches. Apparently, magnets are used to piss off players and make the game unplayable until someone comes by to repair it. Or, so I gathered. Very cool use of lighting and 3D objects on the main display. 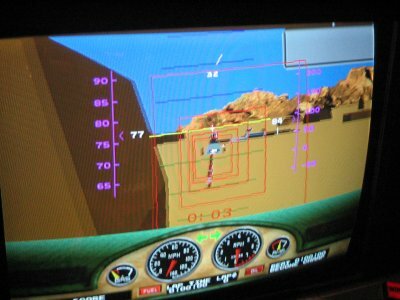 The game playfield is, I repeat, not flat. 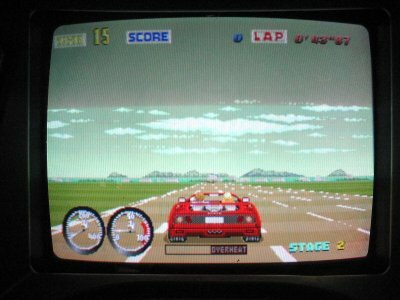 I remember an excellent translation of Outrun my brother had on his Commodore 64 (with awesome music), so I had to put some time in with the arcade original. 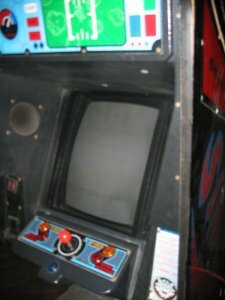 This was probably the most giggly-fun game I played at the show. Objective, shove your opponent. Literally. Its controls are designed for it. 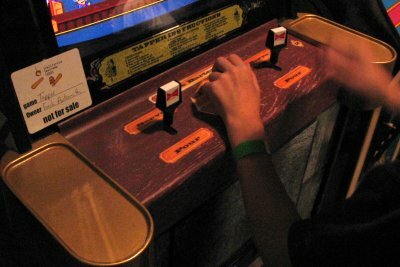 It's a set of a few dozen mini-games, of which it randomly picks 5 for you to play when you start a new game. It's both cute and crazy, and obviously inspired by Japanese game shows. It's really hard to tell how fun Panic Park is from this game, especially since the players aren't really shoving each other. 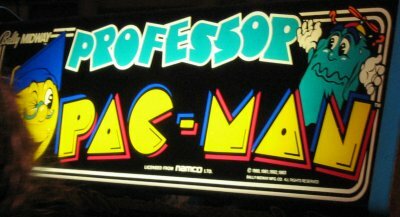 Another favorite from my youth. 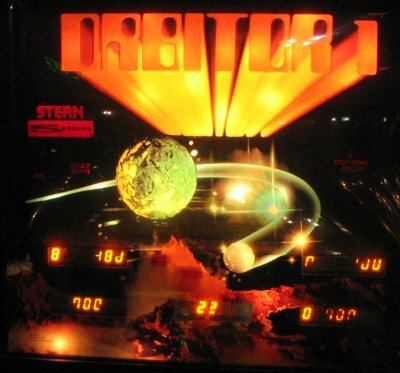 I also have the cartridge version of this on my Atari 8-bit computer, and it's a pretty good (if low-res) likeness. As usual, Olive Oyl is spreading her love (floating hearts) to anyone who'll take it, and Bluto and Popeye are fighting over her, for some inexplicable reason. 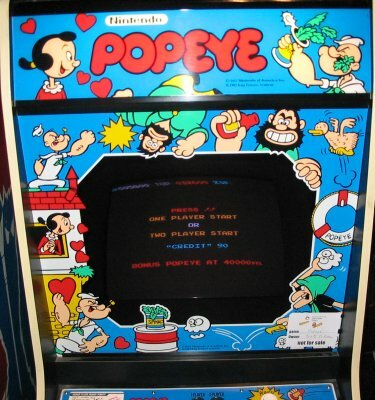 Popeye's very colorful marquee and screen border. 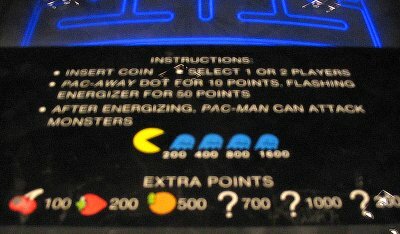 Pac-Man instructions, from a table-top version. 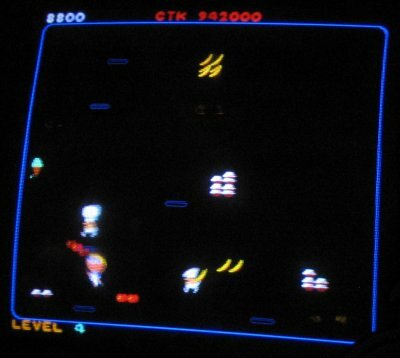 This is a relatively modern game, and one of those non-fighting, non-(car)-racing, non-shooting games that I find quite appealing. You ride a bike, but it happens to be one that flys. They even blow air at you while you're riding. (a.k.a. 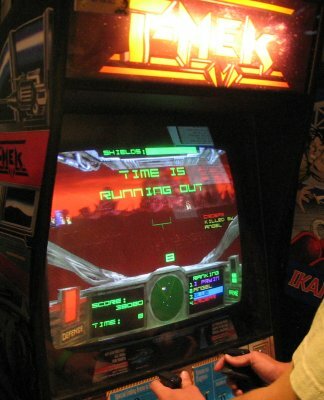 Opistar) I didn't take photos of the working stand-up version, as we've all seen Sinistar. "Run, coward!" Someone had brought in a side-down (and sit-inside!) 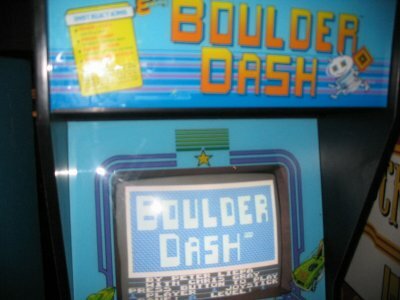 version, just like I used to play as a kid. 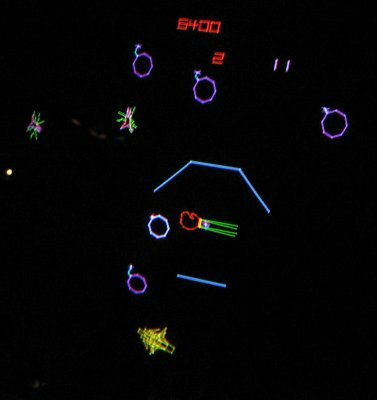 Nothing like sitting inside a dark space ship cockpit-shaped video game with stereo sound blasting "I LIVE!" at you from right behind the ears... "RUN! RUN! RUN!" 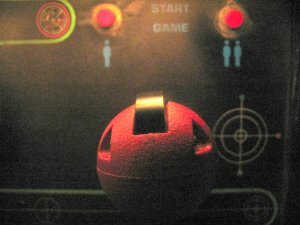 The detailed outside of the cockpit. 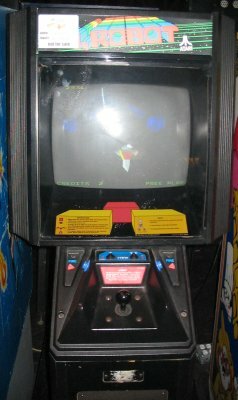 The screen, controls and instructions. Sadly (and I was really sad), this puppy was NOT hooked up. 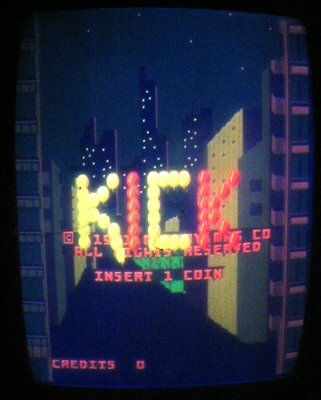 I think I first played this on a friend's Sega Genesis...? 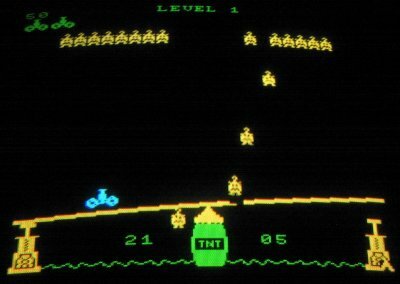 Side note: someone's been working on an EXCELLENT clone of this game for the Atari 8-bit. 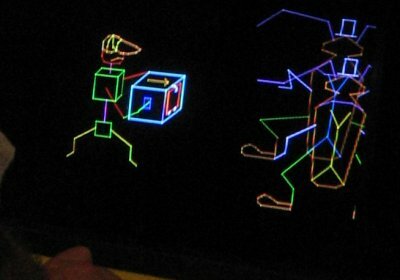 The classic 3D-ish vector game from Sega from the early 1980s. 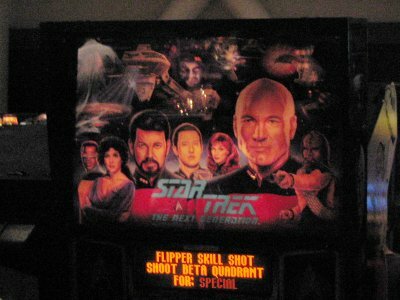 The front imagery of a Star Trek: The Next Generation pinball game that was there. 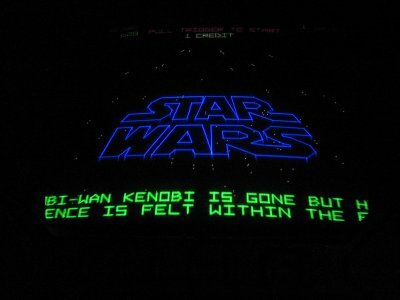 Ah, back when the Star Wars franchise was good. (Well, I missed that hideous-looking Christmas special, and I was young, so I LIKED the Ewoks.) 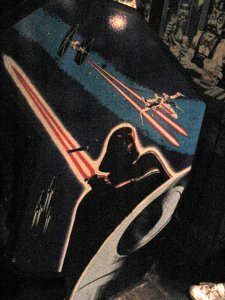 Together with most of the Atari 2600 games Lucasfilm made, this is good stuff in my book! 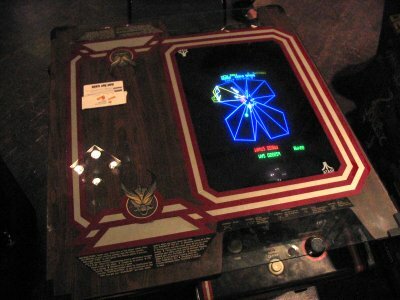 Traditional Star Wars ("A New Hope") vector arcade game. I played this a lot. The sampled sounds of R2D2 and Obiwan were excellent. 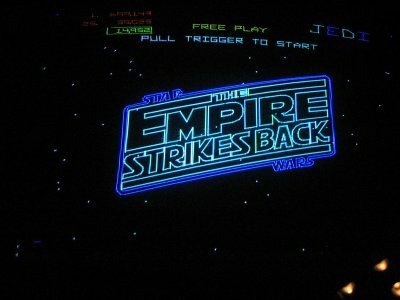 Here's a conversion of the original Star Wars arcade which turned it into Star Wars: The Empire Strikes Back. I had never played it until today. I'll probably give it another go when I return to the show tomorrow. Elsewhere, there was an enclosed sit-down version of the original Star Wars. 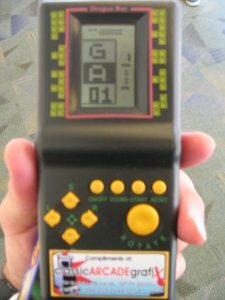 I have this for my Atari Lynx handheld. 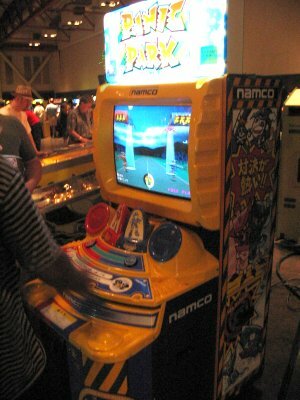 (I played it in the arcade once, after getting the Lynx version. It always amazes me how spot-on the Lynx translations were!) Sadly, this one turned out to be sick. 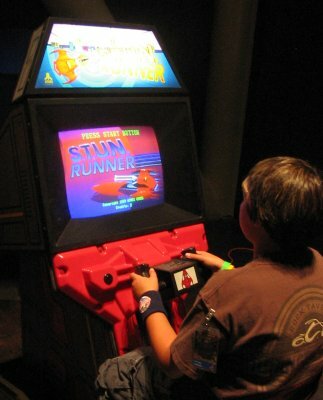 Some kid discovering that Stun Runner is broken. 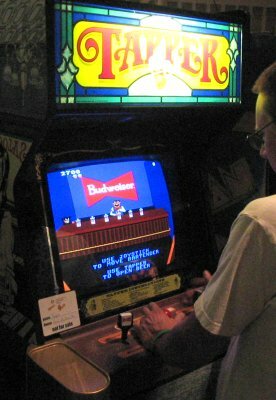 I took note of Tapper because this was the original Budweiser beer-slinging tapper, not the more kid-friendly Rootbeer Tapper that they came out with later. I put Timber together with this as it appears to star the same cut mustached character. 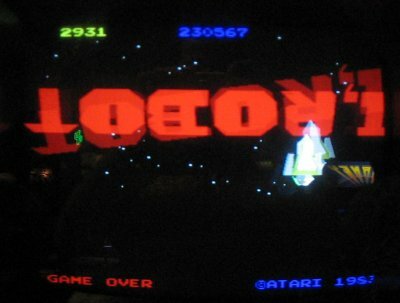 I didn't get a chance to PLAY Timber, yet. Notice on either side: somewhere to set your drink! You can probably just barely see it, but there's the dude from Tapper! 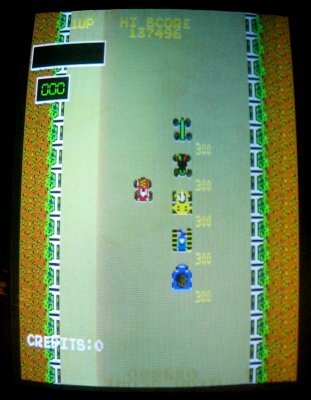 The game had very simple graphics, and charming, almost organ-style music. 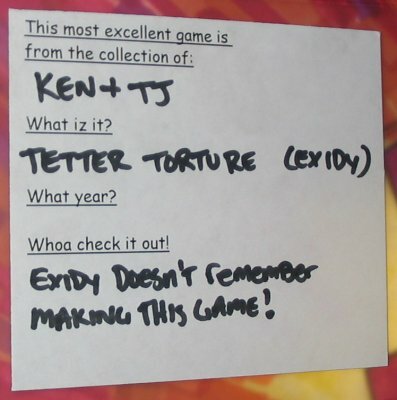 "Exidy doesn't remember making this game!" ...it was always being used when I wandered by. This guy was going NUTS on the thing. Discs of Tron. 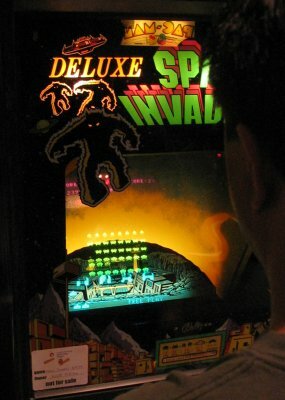 I think I played it once, before today, but only in the last few years. It's quite fun! 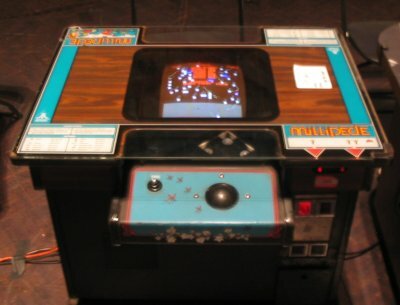 The tabletop version of Tron had miniature controls. 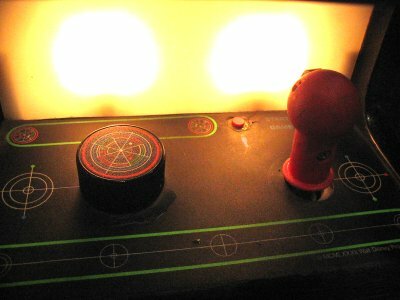 No big, blue, semi-transparent glowing joystick here. Just a little red nub with a little fire button that I almost missed... until I remembered I needed to shoot. 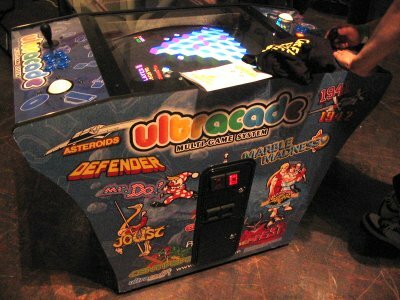 Of course, there was an Ultracade system there, jam-packed with dozens of games I knew, dozens more I had never seen, and a few dozen I probably cared less about (e.g., non-Tekken fighting or sports). 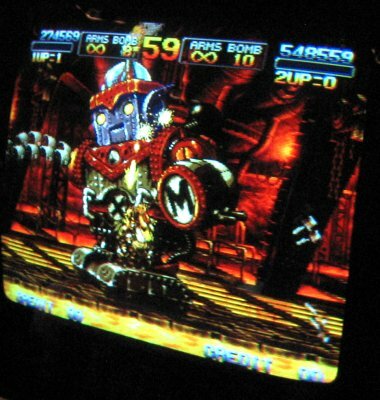 A table-top Ultracade, with tons of artwork on the side. 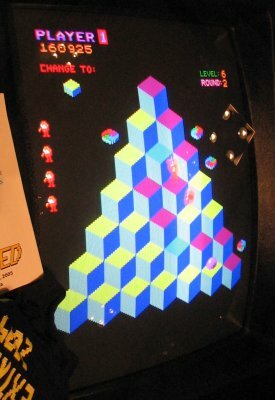 Someone was going crazy with the Q*Bert. Better him than me! #@$! There were numerous Warlords games there. And to think... 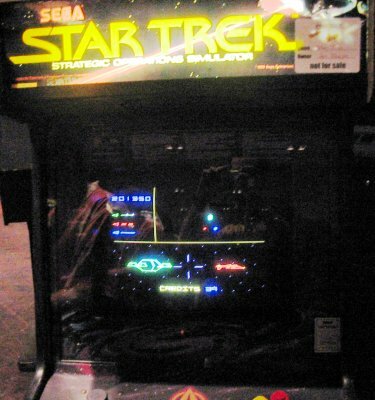 I didn't realize it was an arcade game (I thought it was only an Atari 2600 game) until the late 1990s! Among other things, there was a table-top version there. Probably more comfortable to play sitting 2-by-2 than standing 4-in-a-row. These dudes were betting on the game! Wow, I had no idea this existed. (Prototype?) This is a very cool looking vector game (black-and-white with a color overlay with some neat city foreground). The alien ships walk around on their three legs (of course). 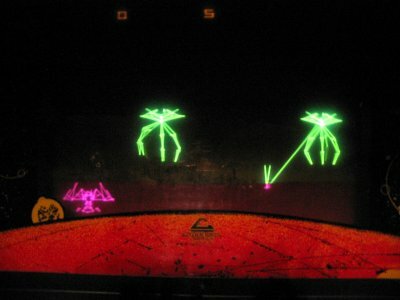 They wander towards you in 3D, firing a cool-looking laser blast across the ground now and then. 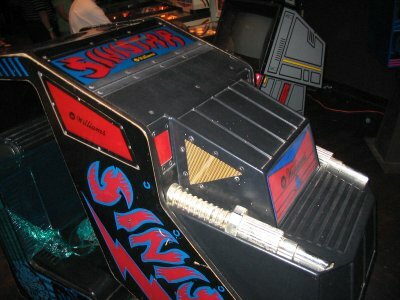 You control a sliding gun, and can bring up a dome-shaped shield, though it shrinks as you use it... then you're screwed. When you shoot, the blasters on either side recoil... nice effect! War of the Worlds marquee. 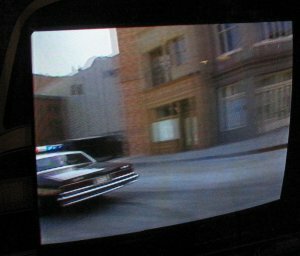 It took me 4 shots to even get one with half'a police car in it. Expensive shirts I didn't want. Oh well. 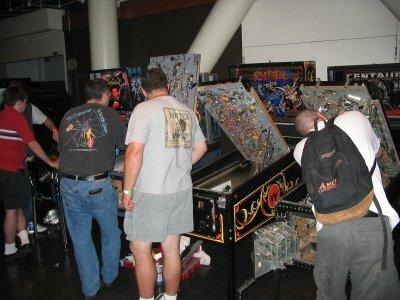 Random crowd-shot near the main set of pinball games. 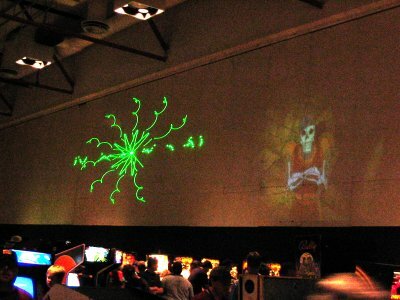 They had a laser projector. Sometimes it was doing random effects, like this. 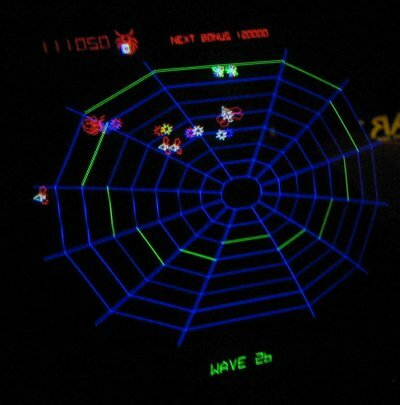 But others, it was powered by Laser MAME, a version of the arcade emulator software that's able to drive a laser projector for playing vector games with true vector graphics! Need to get up high? 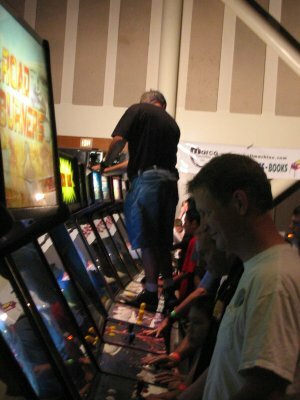 Stand on an arcade game! That's it! 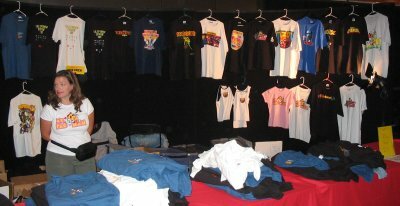 My mostly alphabetically sorted photo journal of my day at California Extreme 2005!